Restaurant Tantris in Munich, Germany still enchants! Restaurant Tantris opened in 1971, and today, with the kitchen in the capable hands of Austrian Chef Hans Haas, this 2-Star Michelin restaurant still deserves recognition. 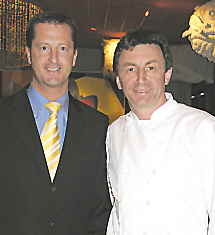 On March 8, 2005, Edward F. Nesta and I had the opportunity to experience Restaurant Tantris and to interview Chef Hans Hass after a phenomenal dinner. The Restaurant Tantris experience begins in their entrance garden with Oriental sculptures and continues inside with plush walls and ceiling the color of burnt sienna, with black accented walls which showcase the paintings. Oriental design is carried throughout the restaurant with sculptures, cactus, and floral design. The tables were draped with crisply starched white linen tablecloths and were adorned with Oriental floral designs of bamboo, calla lilies, galax leaves, and unusual egg-shaped green flowers set in low gleaming crystal bowls. Comfortable black leather club chairs, orange globe lamps that reminded me of Chinese lanterns, and striped rust, taupe and black velvet fabric, create visual sensual appeal along two of the dining room walls. Sascha SpaloviÄ‡, Head Waiter, ensured that our evening was perfect from start to finish. He orchestrated his team, which included, Jenny Merget, with the precision of a surgeon. Our gastronomic evening began with a choice of aperitifs of a 1996 Dom Perignon or a 1999 Legras & Haas. I selected the Dom Perignon, an incredible champagne which was dry, crisp, with a slow stream of bubbles and a slight aroma of white peaches, and vanilla with a long finish, and Edward F. Nesta selected the 1999 Legras & Haas, which had a steady stream of very active bubbles, and a slightly sweet taste on the palate. Chef Haas had created a special tasting menu for us, with the menu handwritten and signed, that hinted of the culinary odyssey we would explore. 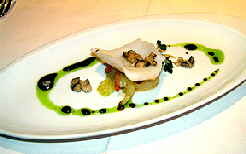 An amuse bouche of a generous slice of squid atop celery and fennel, garnished with chopped mushrooms and drizzled with basil oil was presented on an oblong plate. Although we left the wine pairing in the hands of sommelier Paula Bosch, Edward did look at the wine list which lists 750 wines, (the restaurant has 60,000 bottles in their cellar), and was pleased to see the 1957 – 1961 Cave Bordeaux wines after writing about a 1955 Bordeaux Collectors' Wine Tasting. Paula selected a Karl Haidle Riesling with a floral nose, and a dry tight finish of pears and apples to begin our pairing. Our next amusement came in the form of a filo cone filled with a horseradish mousse deliciously topped with caviar for me, and for Edward, a filo cone filled beef tartar, horseradish mousse, topped with caviar, and served in art-deco style coiled holders. Our first course was a Salad of Bavarian crayfish with marinated hearts of palm, mangos and mache, which was a delightful combination and paired nicely with the Riesling. Our second course was Trout with sauce “mache” and brown butter, which arrived in a fluted bowl, with the trout “floating” in a sea of green sauce. The trout was tender, and especially flavorful with the mache and brown butter sauce. Paula paired a crisp 2002 Pinot Gris from the Rhine Region, which had a less fragrant nose, but was balanced with hints of vanilla, peaches, and ripe fruit and was a very nice companion to the trout. While we were enjoying our trout, Paula was busy decanting our red wine, a 1994 San Leonardo (Trentino), a blend of 60% cabernet sauvignon, 30% cabernet franc and 10% merlot. She first presented the bottle in a wine holder, poured a small amount of the wine over a candle flame into a decanter, swirled it, poured it into a glass, twirled the glass 360 degrees, then poured the wine from the glass into the next glass, to prepare the decanter and the glasses. 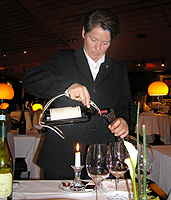 Paula, a dedicated sommelier, is also the author of Paula Bosch Weingenuss and Kuchengeherionnisse & Weinentdecluingon with Eckert Witzigmann and Paula Bosch. She said that she spends about 2 weeks every year visiting about 60 chateaux looking for and tasting of course, new wines. Our third course was Slow baked tuna with glazed onion, eggplant and caper emulsion, which Paula paired with a 1998 Domaine Amiot Guy & Fils Chardonnay, 1st Cru Clos Saint Jean from the Bourgogne region, which was a pale golden color, fragrant, had a deep rich full-bodied flavor with a earthy smell and taste. The tuna with slightly translucent onions, spinach and a slightly salty foamy sauce enchanted my mouth with a number of taste sensations. The wine was beautifully paired, with long legs and a peppery finish. 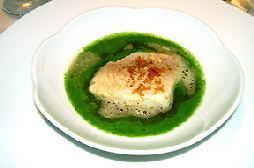 Our fourth course was for me, the piece-de-resistance, a gorgeous Turbot with peperoni and spinach. The turbot was served with one perfect tomato ravioli, which had the rich ripe taste of just picked off the vine freshness, in a sauce redolent of paprika and green pepper. This was an especially flavorful dish, as the fish was tender and flaky, with a spinach, green pepper and fresh tomato spicy black pepper sauce. I found this to be a real star, although all of the courses thus far had been tantalizing. A 2002 – Russian River Valley Rochioli Sauvignon Blanc, which was rich with minerals, vegetables, earthy, and delicious with peach overtones, acted as the perfect companion. 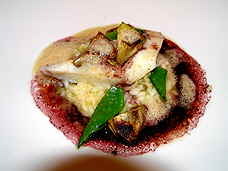 Continuing our adventure with Chef Haas, I had Sole with endive that was topped with a generous slice of truffle in a foam emulsion sauce, and Edward sampled the Stuffed guinea hen breast with endive and Perigord truffles sauce. The Sauvignon Blanc, aged in new oak for 18 months, was smooth, had a balanced nose, and a “pow” of intense flavor en bouche, with a long finish. Our next course was Saddle of lamb with artichokes and confit potatoes for Edward, and for me, Bass with artichoke, sugar snap peas, in a beet emulsion sauce with risotto, which was perfectly paired with the decanted 1994 San Leonardo. 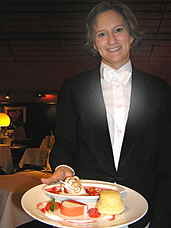 The meal ended with a Degustation of coconut with oranges, which was a pastry fantasy of warm coconut soufflé, coconut ice cream with a gooseberry and blood orange sauce, and a coconut mousse with blood orange gelatin, which was paired with Tariquet, a sweet dessert wine with an Armagnac “burn”. It was a charmingly sweet finish to a perfect Munich night, complete with fluffy, white snowflakes outside. After dinner, I had the opportunity to meet Chef Haas, who is a charismatic man, and dedicated chef, who hails from Austria. This industrious chef not only creates and executes the creative Restaurant Tantris menu; he bakes his own pastries, and also writes and illustrates cookbooks in his spare time, whenever that might be! His cookbooks to date include: Lust auf Genuss, Hans Haas Tantris-Kochbuch and Kulinarische Skizzen. All of the books are written in German and may be purchased at: Restaurant Tantris (shop). At the end of our interview Chef Haas presented me with “un petit cadeau” of homemade yellow plum preserves in a glass jar with a cobalt lid, signed with his signature in gold ink. I am eagerly anticipating opening the preserves shortly and remembering a most remarkable evening at Restaurant Tantris in Munich. Danke schön, and auf Weidersehen, until I return again! Please read Chefs' Recipes where Chef Haas shares his recipes for Auberginen-Sardellen-Terrine, Geschmorte Kalbsbackerl, Wildlachs Mit Lauchpuree and Zitronen-Crêpes Mit Walderdbeeren with Luxury Experience magazine readers. You may also read about Munich and Germany in our Destinations, Hotels & Resorts, Restaurants, Awards, Music Scene, and Gastronomy sections.